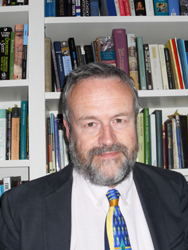 In his recent op-ed entitled ‘For the Kims, the Weakest Link is Family’, published in Asia Times On-line (22 Oct. 2010) sociologist Aidan Foster-Carter discusses the dynastic succession in North Korea. He writes: “I dare to hope for a happy ending. Kim Il-sung’s sociological nous has kept the state he created alive longer than many (me included) had expected. But can it go on for ever? That I doubt. A full answer would loose more hares than there’s room for here. In the 21st century, refusing market reforms is a recipe for self-destruction. Abroad, North Korea’s old game of militant mendicancy, despite some success from the Sino-Soviet dispute right up to the six-party talks, is past its sell-by date; other powers are fed up and won’t play any more. But just to stick to the processes already mentioned, these too are far from foolproof. The weakest link is familism. Past history, in Korea or anywhere – think of the Borgias in Italy – suggests that monarchies or other forms of family rule can be riddled by strife. Some crown princes just aren’t up to the job. People plot, and before you know it the knives are out. 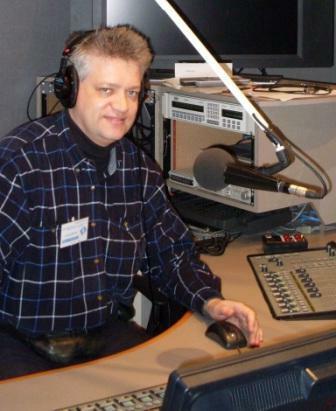 The “Late Night Live” program of ABC Radio National invited Leonid Petrov to discuss this topic with Dr Foster-Carter. “I’m supportive of Aidan’s analysis in general, but would like to defend my own hypothesis that Kim Jong-un is the best candidate for continuing this ‘communist monarchy’ without inflicting any change in politics or the economy of North Korea. My argument is based on two assumptions. First, as long as the Cold War structures continue to dominate regional politics in Northeast Asia, North Korea will be safe by playing China, Russia and the US against each other. The former Cold War enemies badly need North Korea either as a buffer state or as a regional balancer. So, nobody (including politicians in Seoul and Pyongyang) would welcome the sudden and uncontrolled unification of Korea. Second, the dynastic regime in North Korea with its power and legitimacy built on endless lies about the situation abroad and especially in South Korea simply cannot sustain any openness or even minor liberalisation. Instead, endless mobilisation campaigns and anti-imperialist propaganda are the well tested tools for the regime to keep the citizens under total control. There is no room for economic liberalisation or political reform in the ideology of self-reliance (Juch’e) and priority of security (Seon’gun) politics. Since the last thing which the Kim family (who treats the DPRK like its own hereditary property) wishes to encounter is any kind of change or reform, they do everything possible to restrict access to the power for outsiders. Anticipating the imminent end of Kim Jong-il’s era, the clan has nominated the youngest person in the family because they wish the new Great Leader: 1) to be totally dependent on the older members of the family, who would continue running the country business; 2) to have very little or no support base outside of the family, even among such groups as Army or the Party; and 3) to remain alive and maintain the system intact as long as possible, perhaps for another 30 or 40 years. Kim Jong-un, by all means, is the candidate who best meets these criteria. Surprisingly, even the groups who could potentially rival and oppose his appointment, demonstrate solidarity and support. Why? See the above two assumptions on which the very system of Korea’s division is based: the continuation of the Cold War in the region and the reluctance of elite groups to lose their privileged status. Aidan Foster-Carter asks how long can this system survive. As someone who grew up in the Soviet Union during the Cold War and then later witnessed the collapse of the Iron Curtain, I would say that totalitarian societies of this type are extremely resilient and will not falter until liberalisation is imposed from above (as was done first by Khruschev and then again by Gorbachev). Thus, the Kim clan is on the right track by avoiding reforms (of the Soviet or Chinese form) and by grooming a young and inexperienced leader from inside the family. “Europe – North Korea. Between Humanitarianism and Business?” has recently been published by LIT in Germany. In honor of the launching of the book, a workshop will take place at Seoul National University on Wednesday, October 27, 2010. The book contains 327 pages and has four parts: Part I: Human Rights, Humanitarianism. Part II: Economic, Political and Ideological Relations between East/West Germany and North Korea, and their Legacies. Part III: Capacity-Building and Development. Part IV: Investment, Business, and Business Schools. 16.20 – 17.40 Session: “The European Way toward North Korea”. Moderator: Mr. Pierre Clément Dubuisson (Ambassador of Belgium). Paul Tjia, “European businesses and North Korea”. Prof. Sung-Jo Park, “Aspects of European NGOs and EU’s Asia- Invest Programme in North Korea”. Dr. Bernhard Seliger, “Capacity building in North Korea – the experience of Hanns-Seidel-Foundation”. 17:40 – 18:00 Book presentation. SHENYANG, China, Oct. 22 (Yonhap) The first university founded jointly by South and North Korea is scheduled to open next week in Pyongyang, a school official said Friday. The project to build Pyongyang University of Science and Technology (PUST) was launched in 2001 after the two countries’ governments approved a South Korean nonprofit organization to participate in it. 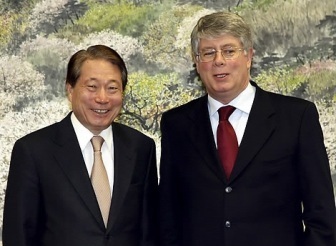 The university’s stated aim is to promote reconciliation and prosperity among the Korean people, separated since the 1950-53 Korean war, and “help North Korea develop the necessary economic and intellectual infrastructure to function as a member of the international community,” according to its Web site. “All the facilities and staff are ready, and we will officially open (next Monday, 25 October),” said James Chin-kyung Kim, the school’s founding president and co-chairman. Kim, a U.S. citizen, also founded the Yanbian University of Science and Technology in the Chinese city of Yanji, a major Korean-Chinese population center. “In time for the opening, 17 foreign professors will fly to Pyongyang from Shenyang (on Saturday). These professors come from the U.S. and Europe,” he said. South Korean staff will also be able to teach, starting next semester, according to the school. Instruction will be in English, and 160 students have been selected for the school’s undergraduate and master’s degree courses in agriculture, information and communication technology, and industry and management. Forty doctorate-level students began studying with four foreign academics in the summer. The university plans to increase the number of students to 500 and open more departments to teach architecture, engineering, construction and public health care. The Dong-A Ilbo (October 22, 2010) Thirty percent of North Korean defectors living in South Korea are considering immigrating to another country chiefly because of discrimination, a survey released Thursday said. 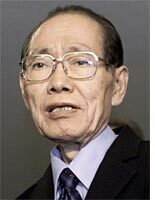 Ruling Grand National Party lawmaker Kim Young-woo commissioned a poll of 210 North Korean defectors Oct. 6-19. Fifty respondents (24 percent) said they wish to go to another country, with four even saying they want to return to North Korea. Among those seeking to move abroad, 21 (42 percent) cited discrimination against defectors in South Korea as the reason, followed by their children’s education (11 people or 22 percent) and the difficulty in getting a job (nine people or 18 percent). On Korean reunification, 80 percent (168 respondents) said, “Korea must be reunified absolutely.” On shouldering reunification costs, 50.8 percent (101) said they are willing to help cover the cost and 17.1 percent (34) said they would help if it is a small amount. On the method of reunification, 52.2 percent (105) preferred absorption as result of the collapse of the North’s communist regime and 23.9 percent (48) wanted a model guaranteeing sovereignty. Rep. Kim acknowledged problems in Seoul’s policy for supporting defectors given the number of defectors wishing to move to another country or even back to North Korea. (by Tad Farrell , NKnews.org October 19, 2010) As most people are aware, Western journalists are not typically welcome in North Korea. The case of Euna Lee and Laura Ling last year was a good example of what can happen to those too eager for an NK scoop. But that didn’t stop David McNeill of London’s ‘The Independent’ travelling to the DPRK just two weeks ago, ostensibly as a tourist attending the Pyongyang International Film Festival, but most likely there to try and cover the impeding Party Congress, initially rumoured to be starting around the same time. He wasn’t the first reporter to enter the country on a tourist visa, and he won’t be the last. But one thing is for sure, 0 Comments and 0 Reactions is a classic example of the hyperbolic and sensationalist approach to North Korea reporting that is standard in mainstream media – a standard where fact-checking and normally rigid editorial standards go right out of the window. ﻿﻿﻿﻿﻿﻿SEOUL, Oct. 10 (Yonhap) Hwang Jang-yop, the highest-ranking North Korean ever to defect to South Korea, was found dead at his home Sunday, police said, adding no attack is suspected in his death. Police said the 87-year-old Hwang appears to have died of old age, saying there was no signs of a break-in at his home in Seoul where a security guard was staying together with him. SEOUL, Oct. 10 (Yonhap) North Korean leader Kim Jong-il and his heir-apparent son reviewed a massive military parade Sunday that marked the 65th anniversary of the ruling Workers’ Party, television footage showed, as Pyongyang steps up a campaign to pave the way for the son to take over. Live footage from Pyongyang showed Kim and his youngest son, Kim Jong-un, watching the parade from the reviewing stand at Kim Il-sung Square in the capital city. 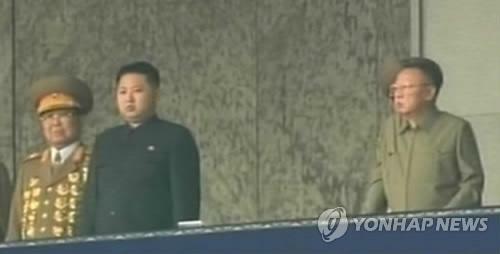 It was rare for the North to televise such an event live, which shows the importance of the show to the regime.